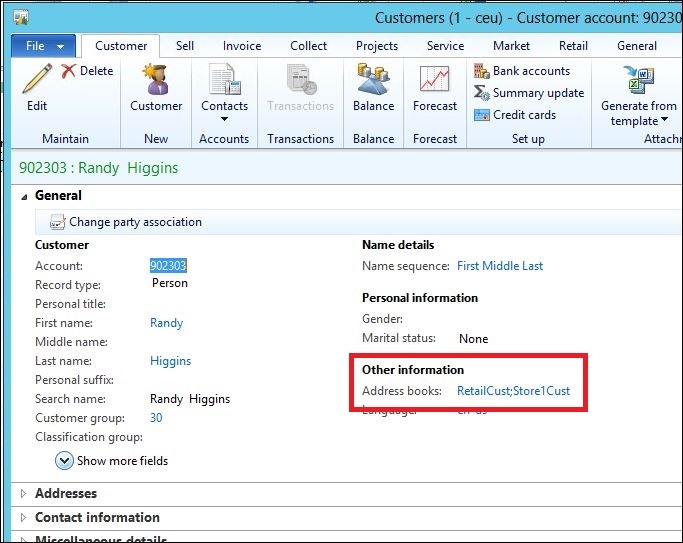 The address book is not a new concept to AX, but in AX 2012 the use of the address books to associate customers was added to retail stores. In working with this topic I have noted and recommend being on at least CU3 for AX 2012 for this to work properly. To assign address book(s) to retail stores, open the properties of a store and you will find a field for “Customer address book”. Each store can have its own way of tracking customers. 1. Store unique – If you are looking to track customers per store and only at that store. Create a unique address book for each store such as “Store #”. POS will only show customers that are assigned to that store. 2. Store unique and All stores – If you are looking to track customers by store but have them available at all stores. Create a “Retail Customers” address book for all customers and then a “Store #” address book for each store. This way POS will list all customers but you can also tell where the customer originated and which store is their preferred store. 3. 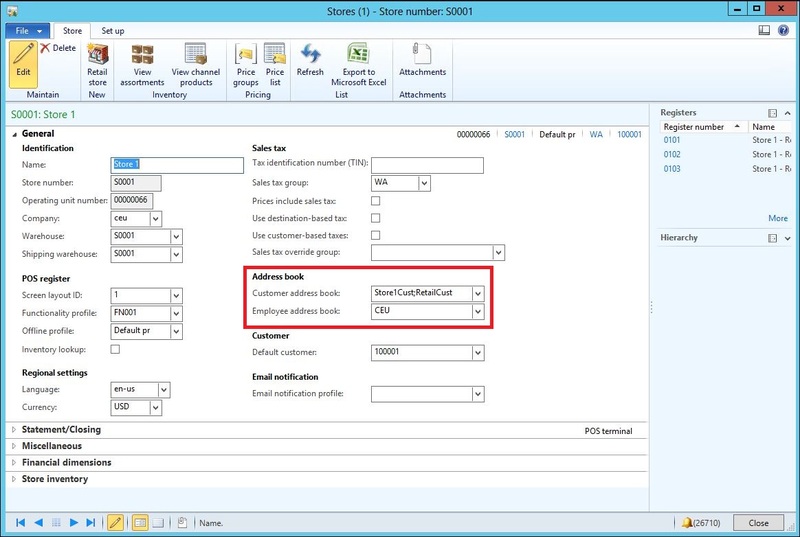 Store unique groups – Another option is creating an address book for a group of stores. Create an address book for a region such as “Washington” stores. POS will show a multitude of customers that are within that specific group of stores. 4. All Stores – Lastly, if the customer doesn’t need to be tracked per store, you can select an address book that lists all AX customers or all Retail Customers. I would recommend setting up a “Retail Customers” address book to separate these from other customers in AX and include a general AX customer address book if needed. So how does a customer get assigned those address books when created at POS? When creating a new customer at POS all address books that are assigned to the store will then be associated to that customer account. If you look at that customers account properties in AX, you will now see the same address book listings. These can be modified in AX Headquarters if you need to add additional address books at a later date, or remove unnecessary ones. Address book assignments are only respected when using A-jobs. If you run an A-1010 to update customers at POS, then those customers in the address books assigned to the store are synced to their appropriate stores. If an N-1010 is ran to update customers, then all customers in AX will be pushed out to all retail stores. Hence, you will have all customers showing up in POS that is not corrected by running an A-1010 job. So this is something to be very careful of. It can be corrected, fixing it would involve deleting all customers at POS, updating all customers in AX, creating actions from the preactions, and then correctly running an A-1010. One last thing to note, the store assignment of customers works in the same way with it does with Employees. The address books assigned to the store for employees allows only those employees associated to that address book to show up in the POS login.